Happy chicken week! 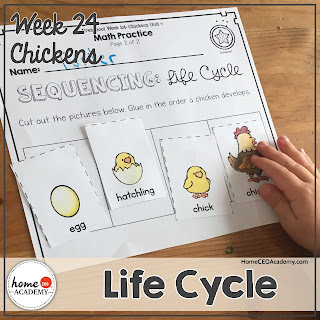 Chicken is week 24 of our 46 week totschool curriculum. Take a look at just a fraction of the activities from our week! Time to count the eggs! Now it's time to sort the eggs! 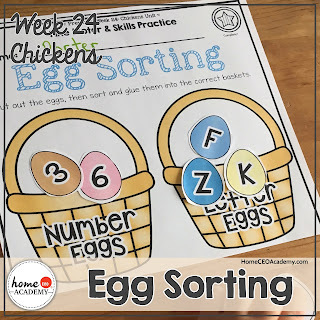 You can take this activity a step further and ask your little one to sort by color too. 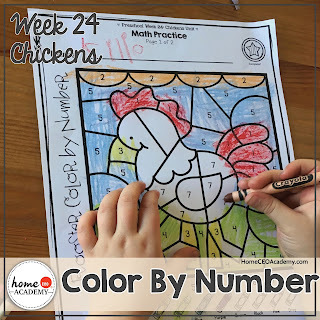 Kylie, 6 years old, snagged this color by number off the printer and before I could get to the kitchen and say, "That's your brother's worksheet." She was almost done! 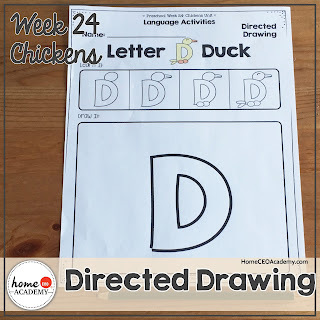 I am super excited about these directed drawing pages! Porter can make it to the second step before he usually goes "free form." But hey, it is progress! 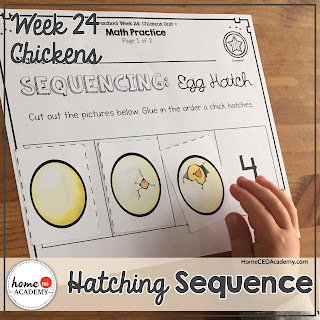 We really liked these sequencing cards. 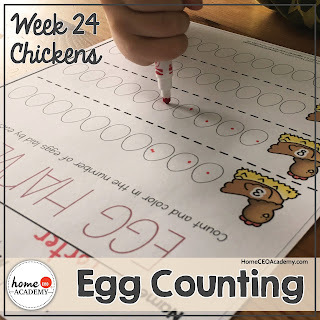 There are some fun time lapse egg hatching videos on YouTube that I'm sure your little one (and you!) would enjoy watching! 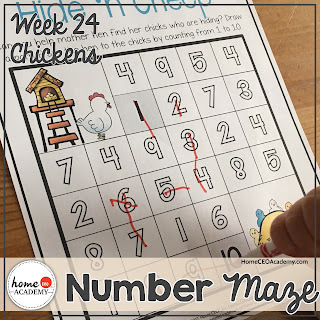 We took our number maze skills to a new level this week by following a sequence! 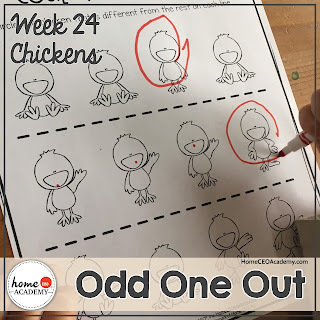 Can your little one spot the peculiar poultry? My kids have selective hearing. But if there is one thing I've learned over the last 6 years, "Dinner is ready." 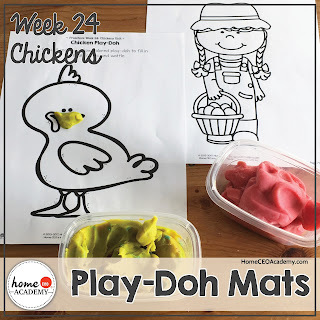 and "Play-Doh time." are sure fire ways to get to to some to the table! 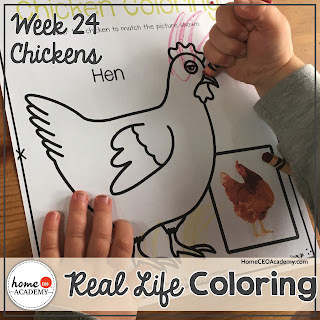 "This chicken has a red mohawk," said my 3 year old son. 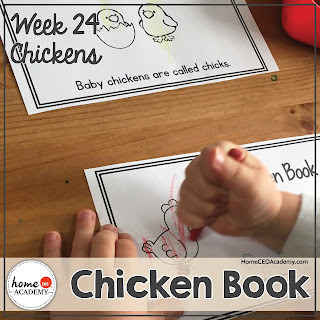 I hope you enjoyed a little peak into our chicken week. Please check out our website for more information on our full year curriculum or feel free to send me an email. See you next time!